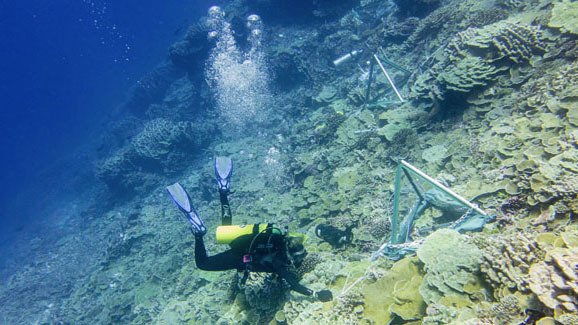 A study by researchers at San Diego State University (SDSU), the University of Hawai‘i at Manoa (UH), Scripps Institution of Oceanography at University of California, San Diego (UCSD) and others revealed that the bacteria present in the water overlying dozens of coral reefs changed dramatically during the night, and then returned to the same daytime community as observed the morning before. Further, as if these communities were all privy to the same schedule, these changes were synchronized across reefs separated by hundreds of miles. The team discovered that a group of microbes called Psychrobacter appears to be leading the way. Surprisingly, Psychrobacter can make up 40-70 percent of the marine microbial community during the day, and is a hundred-times more abundant than during the night. This work was funded by the National Science Foundation, Hawai’i Sea Grant and the Gordon and Betty Moore Foundation.